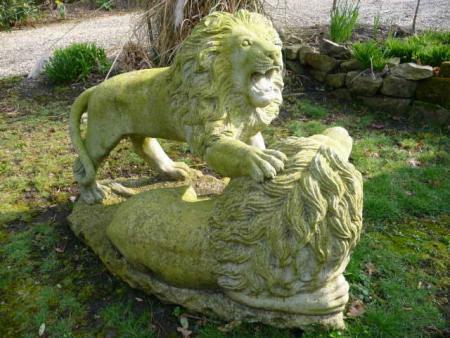 A SUPERB MARBLE GARDEN SCULPTURE OF 2 LIONS PLAYING DATING FROM THE 1920,S OR EARLIER. NOT TO BE CONFUSED WITH MODERN REPRODUCTIONS WE PURCHASED THEM FROM A TITLED ESTATE IN CHESHIRE IN THE 80,S. PROBABLY ITALIAN .OVER 2 TONS OF MARBLE HAND CARVED OUT OF A SINGLE PIECE. WOULD LOOK STUNNING IN ANY GARDEN OR WITH A QUICK CLEAN,INDOORS. CONSERVATORY,GRAND HALL WHO KNOWS? THEY MEASURE 1.68m 66"L, 40" 1.02m HIGH AND 36" 91cm WIDE. FEEL FREE TO VISIT OUR LIONS OR ASK FOR MORE PHOTOS.